We examine major developing trends in financial markets and the impact on ETF performance. Our analysis includes leading ETF performers along with laggards and specific actionable ticker symbols to invest in. The SPDR S&P 500 ETF (SPY) ended January down 3.5% and more losses could be ahead according to the January Barometer. The indicator states the yearly performance for stocks will mimic the January performance for the S&P 500. Although the January Barometer failed to be correct in 2009 and 2010, it has successfully predicted the direction of stocks 88.9% of the time over the past 63 years. 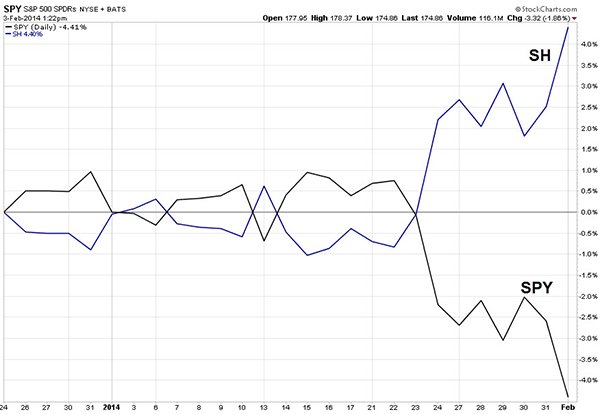 Weak performance in the stock market has meant good performance for inverse ETFs like the ProShares Short S&P 500 ETF (SH), which aims for daily opposite performance to the S&P. The Greenhaven Continuous Commodities Fund (GCC) is edging higher as commodities prices continue a climb that began in late 2013. GCC equally weights a basket of 17 different commodity futures contracts, including oil, soybean and sugar. Coffee prices have surged 21% and are off to their best start since 1997. A drought in Brazil, the world‚Äôs largest coffee exporter, has caused bean prices to boom. Elsewhere, precious metals prices (GLTR) are booming again and gold prices have rallied almost 4% since mid-December. Bullish sentiment toward bullion is picking up steam too. The net-long position in gold contracts rose 40% during the week ending Jan.28, according to data from the U.S. Commodity Futures Trading Commission. 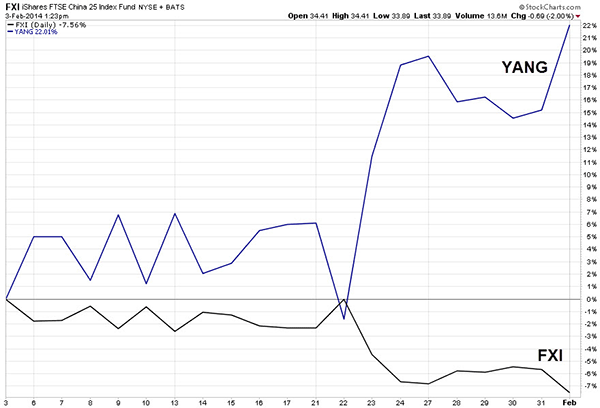 Stock market volatility has seen a sharp reversal from down to up in 2014. Although the CBOE S&P 500 VIX posted its worst annual decline in five years by falling 23.9% in 2013, the VIX has already surged by that much in January alone. 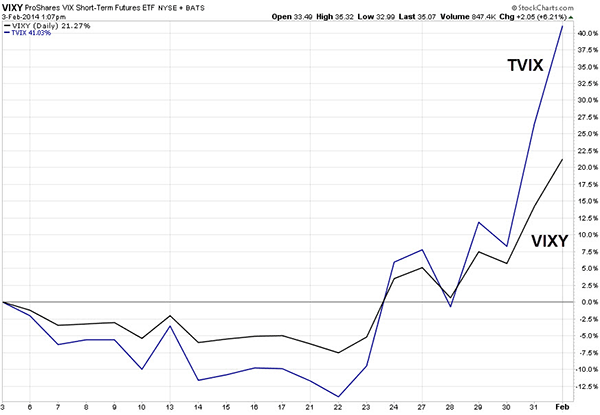 After posting deep yearly losses, ETPs that go long volatility have rebounded strongly. The VelocityShares Daily 2x VIX ST Futures ETN (TVIX), which aims for double daily performance to the VIX, has soared more than 40% over the past month.. Other funds, like the ProShares Short-Term Futures VIX ETF (VIXY), which give exposure to the VIX minus leverage are also heating up. 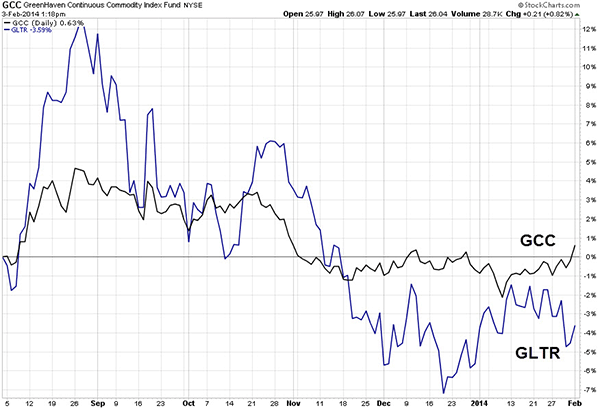 Emerging markets have been trending lower, led by notable weakness in Chinese equities (FXI). The iShares Large Cap China ETF (FXI) has fallen around 10% over the past two months and if China‚Äôs liquidity crisis erupts into something broader, it could spark further selling. China‚Äôs official purchasing managers‚Äô index decelerated to 50.5 in January, and all signs point to economic slowdown in the world‚Äôs largest emerging market. ETFs that provide inverse exposure to Chinese stocks are star performers. The Direxion Daily China Bear 3x Shares (YANG), aimed at triple daily opposite performance to Chinese stocks, has skyrocketed over 20% year-to-date. After hitting a yearly high of 3.96% on Dec. 31, it‚Äôs been all downhill for the yield on 30-year U.S. Treasuries. Thus far, the Federal Reserve‚Äôs recently initiated $10 billion tapering of monthly Treasury bond purchases has yet to negatively impact Treasury prices. 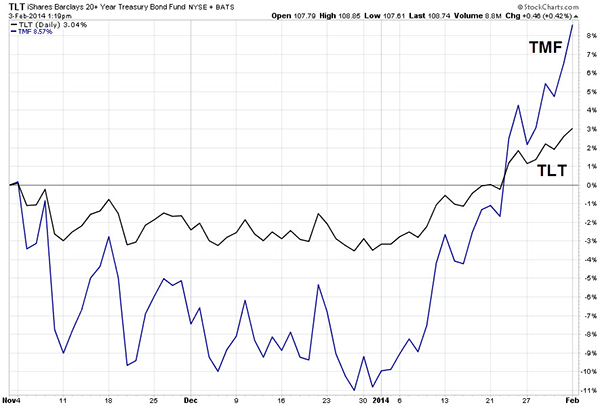 Yields have fallen toward 3.6% and bond prices are rising. For now, the investment theme of higher rates is on hold. Investors are fleeing out of stocks into bonds and thereby pushing up bond prices. The Direxion Daily 20+ Yr. Treasury Bull 3x Shares (TMF) is already ahead more than 8% year-to-date as bond bulls return.